Distinctive indoor and outdoor seating inspired by mid-century geometric design inter-fused with modern industrial flair. 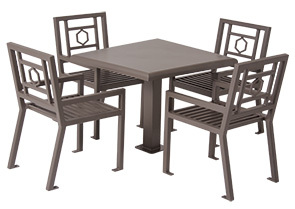 The Huntington Collection Tables and Chairs revitalize the overall appeal of patios, courtyards, cafes and business parks. The spacious 36" square table top is supported with a bold 4" pedestal surface mount frame to provide excellent stability and accessibility. The armchairs backrest and seat utilize a 1" and 1-1/2" square tube construction and feature	versatile footings to help accommodate various installation requirements. Protected against the elements, an ultra-durable powder-coat finish ensures that the Huntington Collection will remain in top condition throughout the years. Comprised of a solid square pedestal table and 4 decorative armchairs, this collection displays innovative craftsmanship through precision lines, geometrically styled decorative elements and ultra-modern all-steel construction.